Mt. Vesuvius, the active volcano that looms over the Bay of Naples in southern Italy, has erupted well over 30 times that we know of. 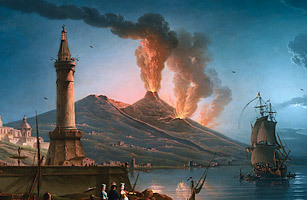 And yet its most famous eruption took place all the way back in A.D. 79, when a multiday eruption of lava and ash covered the cities of Pompeii and Stabiae in ash. Pliny the Younger, author of the only surviving eyewitness account, described a sudden explosion followed by blankets of ash that fell on people as they tried to escape. The total number of Vesuvius' victims will most likely never be known, but archeologists are aware of at least 1,000.